In what is likely the result of a bug, a number of SSD custom-built configuration options have disappeared from Apple's 27-inch iMac lineup in its online store, with 1 TB and 2 TB options now missing entirely. On the 27-inch iMac, available storage upgrades have varied depending on which stock configuration is used as the starting point, with the low-end and middle-tier models allowing customers to select from 256 GB, 512 GB, or 1 TB of SSD storage as upgrades from the standard 1 TB Fusion Drives, while the high-end model allowed for upgrading to 512 GB, 1 TB, or 2 TB of SSD storage from the standard 2 TB Fusion Drive. As of today, however, the available SSD options on the 27-inch iMac lineup in Apple's online store are much more limited and somewhat conflicting depending on the starting configuration. On the low-end model, 256 GB is now the only SSD upgrade option available, while on the middle-tier model Apple is showing no SSD options at all. For the high-end configuration, only a 512 GB SSD option is available. 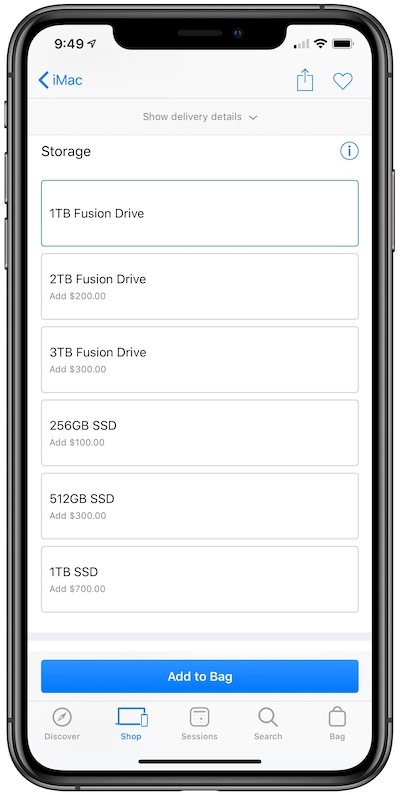 While the change is consistent across Apple's online stores in multiple countries, the Apple Store iOS app continues to show all of the usual SSD options. The 21-inch iMac is also unaffected in either the online store or the app, with Apple offering up to 512 GB or 1 TB of SSD storage depending on starting configuration, and it makes little sense for the 21-inch model to offer better SSD options than its larger sibling. As a result, this is very likely a bug with Apple's online store that should be fixed relatively shortly. Update 4:15 PM: Apple says this is indeed an error and is fixing the issue. Apple replaces them with 5400 rpm drives. Silent but sweet update before year end with vega graphics...in line with macbook pro 15 inch upgrade? Something is cooking ...(excuse the pun Tim). 2019 looking promising for desktop Macs following the MacMini. Almost 4 hours after this story broke and no "corrections" made. Starting to feel less like a bug and more like an imminent upgrade. It took 10 hours, but Apple did finally get back to me. It's an error, and they're fixing it now. The MBP just got Vega GPU's, so that's two spec bumps this year, with none for the iMac. Though for desktops, I prefer separate computer from display, as you can buy what you want display (and now eGPU) wise, and more importantly, the noise of the computer can be put away from you rather than being right near your face where you can hear it and it annoys you. BTW, if anyone wants the higher SSD options, the iOS app strangely still has them. Go figure. It's STILL showing the "512 GB SSD" as the only SSD option, online!